This week’s secret ingredient is Cucumber. I love the abundance of organic cucumbers in the summer. Cucumbers provide us with valuable antioxidant, anti-inflammatory, and anti-cancer benefits. 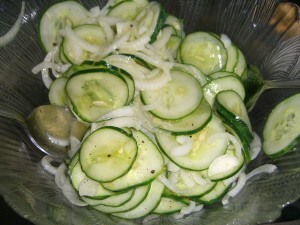 Cucumbers are a valuable source of conventional antioxidant nutrients including vitamin C, beta-carotene, and manganese. Cucumbers should be stored in the refrigerator where they will keep for several days. If you have a leftover piece of cucumber, place it in a tightly sealed container or tight plastic wrap so that it does not become dried out. Best if used within a day or two. I love to add cucumber to my morning juice. Combined with other anti-inflammatory foods it adds a very refreshing aspect to my Green Elixer of Life. If you don’t have a juicer yet you can still eat them for breakfast by slicing them and topping them off with eggs. Or add some spears to your jug of water and you’ll be drinking a lot more water. 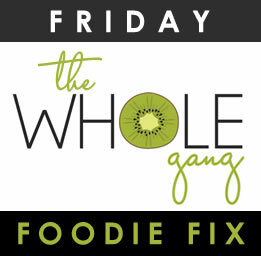 Next Week’s Secret Ingredient for Friday Foodie Fix is … Summer Squash! Now it’s your turn to share your gluten free recipes with cucumbers below. I love this Friday event! I love learning new things about the seasonal fruits and veggies that I love and finding new ways to use them. Thanks so much for doing this each week and for sharing my Chocolate Zucchini Wake Up Smoothie! Cucumber, love it too!! I'm linking up a Fennel Orange and Sesame Salad that has a cucumber crunch to it. This is my first time joining your Friday secret ingredient event. What a fun idea! In my opinion, cucumbers should have their own food group! I don't have any cucumber recipes because I eat them before I can cook with them! Dipped in salsa is my fav snack. I do hope this Friday finds you well. Thank you high highlighting my raw zucchini pasta! I so enjoyed the other fabulous recipes. This week I am sharing pesto stuffed cucumber and a fun way to serve cucumber as an appetizer: topped with a beautiful fig and raw carrot hummus.